Romantic, delicate and pretty. Wedding confetti is typically thrown in celebration after the newlyweds exit the ceremony. We love a confetti shot at all of our Best Day Ever Venues, read on for our confetti top tips, dos and don'ts and inspirational ideas. As far back as The Romans, wedding confetti was thrown to wish fertility and prosperity on the couple. Well wishers would throw a local seed or grain. As the tradition evolved, rice became a popular choice to shower the newlyweds. In Italy, it became tradition to throw sugar coated nuts, or confectionery, from which we get the word confetti. In the present day, we’re lucky that rice and sugar-coated nuts are no longer in favour; thankfully we tend to use something a little softer to the touch such as biodegradable flower petals, which make for absolutely stunning wedding photographs. We love confetti at Best Day Ever venues! We allow biodegradable confetti to be used in certain areas of the wedding venue. Your dedicated Event Manager will be happy to show you where we allow confetti to be thrown. Your professional Photographer will be able to organise that all important confetti shot for you with the guidance of your Event Manager. We don’t allow confetti bombs, confetti cannons or any metal/foil confetti at any of our venues. In the winter months, if we’re expecting a frost overnight, we don’t allow confetti to be thrown outside in order to keep the grounds in pristine condition for weddings. Confetti will freeze to the ground and be difficult to clean up after the celebrations. If you're planning a winter wedding you can still have that magnificent confetti shot in the warmth of your ceremony room. Your Event Manager will give you some guidance on how to make the most out of this fantastic tradition. It's best to coordinate the flurry of confetti for maximum impact inside the ceremony room. WE'd always advise chatting it through with your wedding photographer who will have some great ideas about how best to capture the moment. Supply your guests with confetti. Guests rarely bring their own. Pre-fill confetti cones for your guests. Some venue dressers such as Jam Jar Weddings and Events can make bespoke confetti cones or can supply you with appropriate wedding confetti props. Use cling film to cover your pre-filled confetti cones so no petals are lost in transit to the wedding venue. Your Event Manager will unwrap the cling film during setup for your big day. 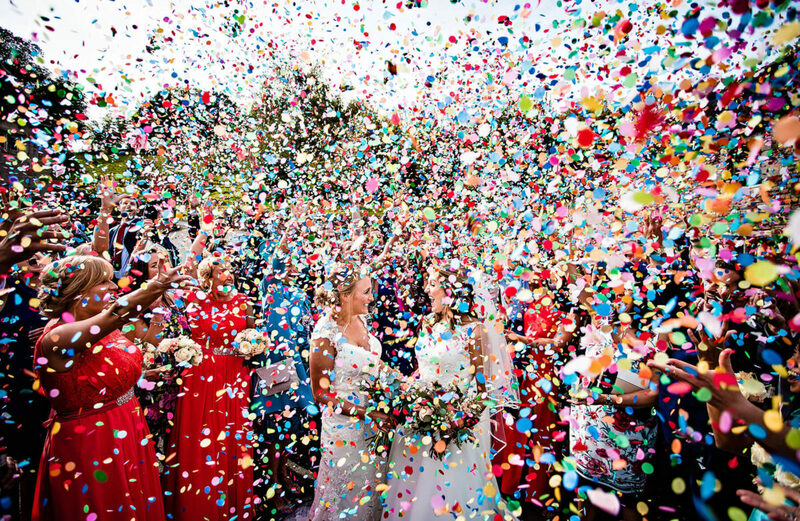 Bright bold colours add wow factor to your wedding confetti shot! Bubbles - A cute and fun alternative to traditional confetti. Pressed Daisies - Add an extra splash of summer with pressed daises for confetti. Lavender - A lot of fun and smells amazing! Sparklers - As the sun sets on your wedding day, go outdoors for a twinkly sparkler shot (Check with your Photographer first). Work with your Photographer to organise that perfect shot. Make sure your guests know when to throw the confetti, your Photographer only gets one chance to capture it so timing is everything!